Yep, I did it... I turned IHOP into a cupcake (or so says my friend, Nicole). And to be honest, when my husband asked me to make these about a month ago, they sounded pretty disgusting to me. Bacon in/ on a cupcake??? Ewww! However, I decided to amuse my hubby and make them for him right before going out of town for a few days (figuring if I didn't enjoy them, he could have them all to himself-- ha). I used my regular vanilla cupcake recipe, but substituted out a couple little things according to what I thought would make the cupcakes taste like buttery pancakes. 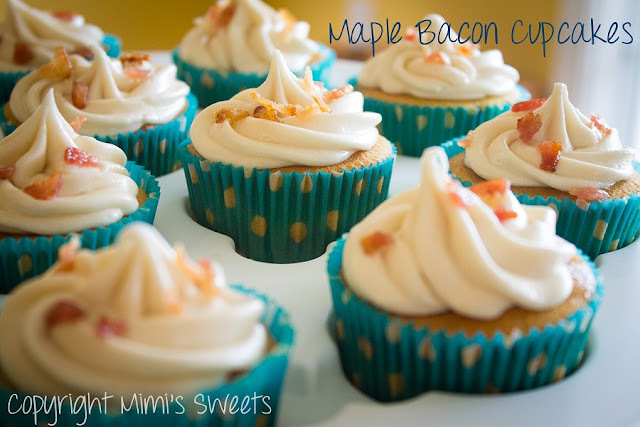 I put some bacon in the cupcakes, used my super yummy buttercream frosting for this creation (but turned it into maple buttercream icing), even topped the frosting off with more bacon, and if you look closely, you can see that there is even maple syrup underneath the frosting, soaking into the cupcake. I always have to try at least one of my new creations, because, well, I so very often experiment with flavors and make up recipes, that I don't really know how it's going to taste. I usually think, "Well, let's see how this adventure goes... It should be fun!". So, I tried the first one that came out of the oven (and put the frosting and bacon on top), and I never expected them to taste the way they did! I literally thought that I had just taken a bite of pancakes and bacon with maple syrup! It blew my mind (in a great way, of course). So, obviously I couldn't wait to surprise my hubby with them when he got home from work that day. His response when he took the first bite? "Oh, these are amazing... You work magic!" I'll just say one more thing... these were so good, that my friend (the one I spoke of at the very beginning of this post-- who I must add, does NOT eat frosting of any kind... she hates the stuff) actually ate the frosting with the cupcakes when I gave her some of these! If that doesn't say something about how great these were, then I don't know what would. Any weird sounding combinations that you might think would be great in cupcake form? I'd love to hear from you!